When I found my husband flipping picture-perfect gluten free dairy free egg free pancakes one Saturday morning, I nearly broke into tears. In the beginning, the modifications we made to our son’s diet threw my husband for a loop. Weekends were his time to cook breakfast. It was a tradition he enjoyed, but remove gluten, eggs, and dairy and it became a serious challenge. So when I saw my husband flipping picture-perfect pancakes one Saturday morning, I nearly broke into tears. “Those have got to have egg in them,” I exclaimed. Nope. They were the most beautiful gluten free dairy free egg free pancakesI had ever seen! That’s when I knew I had married a genius and Saturday Pancakes were born. 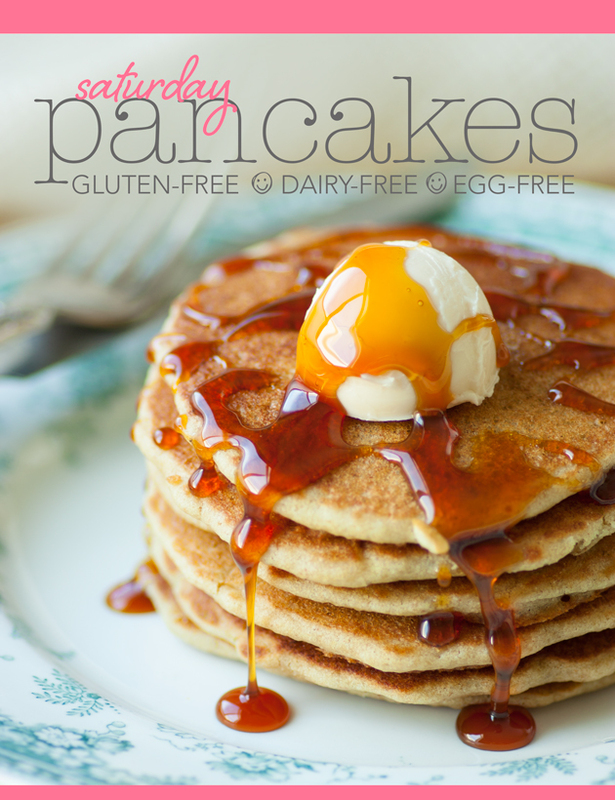 This recipe for Saturday Pancakes is featured in my cookbook Everyday Classics: 68 Tasty & Essential Gluten-Free, Dairy-Free, Egg-Free and Soy Free Recipes. The simplicity of it is a good example of my effort to deliver a collection of recipes that make the transition to a gluten-, dairy-, and egg-free diet relatively easy, hassle-free, and tasty. On the occasion I use a ready-made gluten-free flour blend, I opt for Bob’s Red Mill All Purpose Gluten Free Flour 1) because it is gum-free and 2) because it has proven to be one of the best performers when baking without eggs. Bob’s Red Mill is readily sold in here the U.S. For my friends abroad, check out my recipe for Bob’s Red Mill All Purpose Gluten Free Flour Substitute. Preheat oiled griddle to 350-375?F. In a large mixing bowl whisk together water and chia seed meal. Set aside 2-3 minutes to thicken. Whisk in honey, shortening, and vanilla extract. Add flour and salt and whisk until smooth. Add baking powder and baking soda. Whisk just until incorporated. 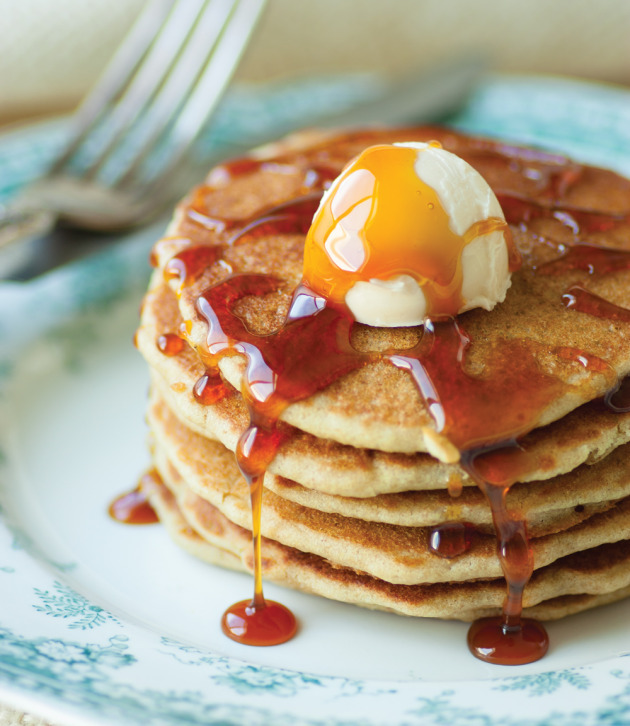 Using a 1/4-cup measure gently scoop batter onto griddle to form 4-inch pancakes. Cook until bubbles appear and begin popping on surface. Flip and cook 1-2 minutes more. Best enjoyed hot off the griddle. Batter may be prepared in a blender. Simply add all ingredients to blender container except for baking soda and baking powder. Blend until smooth. Add baking soda and baking powder and blend just until combined. Pour batter from blender container for perfectly round pancakes. 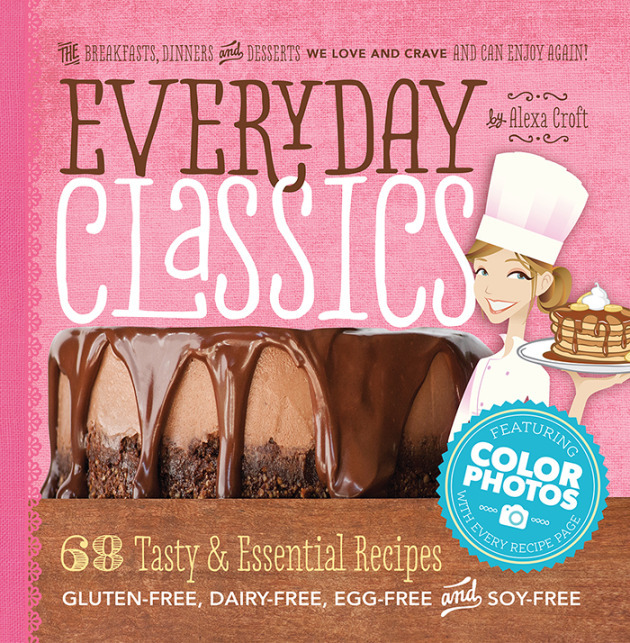 If cross-contamination with tree nuts and soy are a concern, I provide a recipe for a nearly identical homemade blend to Bob's on page 39 of Everyday Classics. It may be used 1:1. One reader asked what palm shortening was. It is non-hydrogenated palm oil—an allergy-friendly fat. I use it here on my site because not everyone tolerates coconut oil and butter is off limits for the dairy-free among us. Avocado oil works great as well. That's so great you have found a new pancake recipe! What exactly is palm shortening? I don't have a grinder to make the chia seed meal. Can flax meal be used as a replacement with the same results? Thanks, Lexie! I so enjoy your blog! Wow, just…..Wow! I can't believe how good these pancakes are!! I used 3 T. of flax meal and they resembled pancakes with eggs! I now have the only pancake recipe I will ever use! Thanks, Lexie! i am so excited to try these! i am on a weird diet for my allergies! these sound really good! I can't have eggs/ flax or chia seeds, what could I use??? I just made these! But I noticed i didn't have any all purpose flower on me, so i used the second closest thing i had- corn meal. I threw the corn meal in my nutrabullet to smooth it out, then continued with the recipe. The out come was corn bread, and it was amazingly delicious. Because of my allergies I haven't had corn bread since I was 9 (I'm currently 16) and it was a nice suprise. Just letting you know if you swap the flower with corn meal you get REALLY good corn bread! Bianca, well thanks for letting me know! I will have to try that. We have a few cornbread lovers in this house. 🙂 I think it's awesome that you are in the kitchen experimenting like this at 16! So impressed. I didn't start experimenting until I was 40, ha! Thank you so much for posting this Lexie. I've been searching online for an egg-free, GF bread…haven't had pancakes (real pancakes) since we started this journey a few years ago. I'm excited to try this. And thanks to Dee for her flaxseed measurement since that's what we'll be using and Bianca for her advice on cornbread, since we haven't had that either 🙂 This is such a blessing. I'll be looking more at your site. Love this recipe!! And just ordered your book, can't wait! Just a question for the nerd in me: do you have any calory counts in your book or even better yet an estimate for this brilliant recipe? My son is allergic to dairy, gluten, eggs and almonds. So glad I was able to find your cookbook! Vanessa, I know well what it feels like to be in your shoes. After 4 years of being the same, we have finally (and victoriously) introduced eggs. There is hope 🙂 My guy is now almost 7. My daughter can't have any form of sugar right now (candida diet). Can I leave out the honey? I JUST made them and they came out terribly, I think it was the flour I used. I used a GF flour by Pure Gold. Ingredients: rice flour, ground flax seed, quinoa flour, buckwheat flour, tapioca flour, arrowroot flour. and xanthun gum ….my pancakes came out extremely gloppy and thick…like sticky. Do you think it was the flour? I used flax meal instead of chia so I used an extra tbs. I ended up adding a lot more water and coconut almond milk but it was still so think, gloopy and sticky. What anti candida recipes can you recommend for a 21 month old with only 8 teeth?? Hi Emily, yes it definitely was the flour. Rice flour was the culprit. I do not know of any egg-free rice flour-based pancakes that work. Bob's Red Mill is bean-based and for some reason holds up well when not using eggs. The candida diet is pretty intense. I would also look at the Paleo diet or Perfect Health Diet. In a sense they are similar to candida. My good blogging friend Ricki runs a site dedicated to Anti-Candida. You may want to check out her site http://www.rickiheller.com. The kids are gobbling them up! Can’t wait to try these! 🙂 Seems like when I try with coconut flour it always fails 😛 Thanks! I’m on an elimination diet and cannot have honey. Is the honey in this recipe for texture or for flavor? What could I use as a substitute? Wow! These look amazingly delicious and I love that they even have chia seeds in them. Simply wonderful!